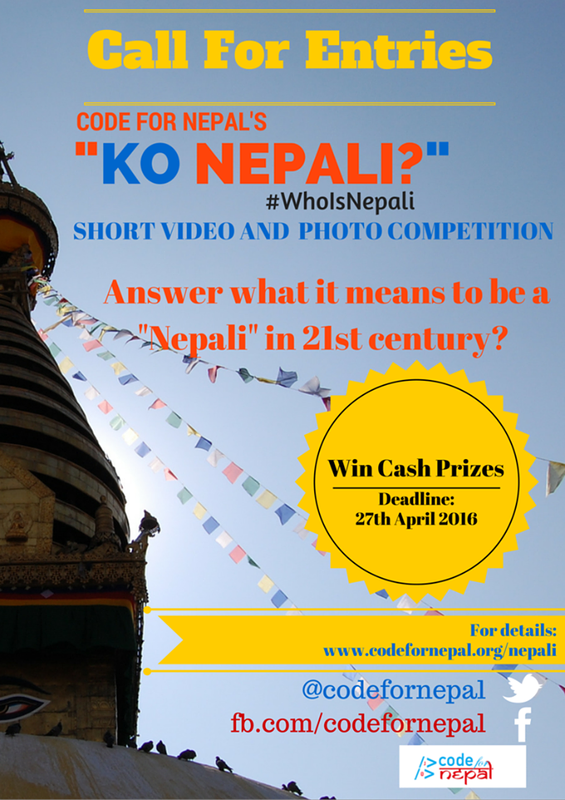 Code For Nepal announces "Ko Nepali" video and photo competition. For all those Nepali photo enthusiasts and video makers, here is a fun competition for you! +Code for Nepal is accepting applications for "Ko Nepali" video and photo competition. +Code for Nepal is a US non-profit organization focusing on internet access, open data, and digital literacy in Nepal. It was formed by co-founders Mia and Ravi at World Bank's Open Data Day hackathon on February of 2014 after reviewing the landscape of Internet access and open data in Nepal. The competition aims to recognize digital literacy skills and facilitate conversation about who is a Nepali and what it means to be a Nepali, while strengthening a culture of creativity and civic debate online. Any Nepali amateur photographers and videographers, living in Nepal or abroad are eligible for this competition except for the professionals. There is no charge for the competition but the entries should reflect on "Who is Nepali?". Only one submission is accepted and for video, should be no longer than 3 minutes and can be in Bhojpuri, English, Maithili, Nepali, or Tamang. This competition might be a way to know who we, as a Nepali, really are. Different perspectives from Nepalese all around the world would be a helping ground to share different forms of ideas. Each unique concept would be something new to learn. At the very least, this could be a better time allocated for some fun competition online. Think about what it means to be a Nepali? Discuss with your friends and family. Write one or two paragraphs on what do you think it means to be a Nepali! Find a quiet and bright place. Give your smartphone/video camera to a relative/friend. Ask her/him to record your thoughts while you speak. You could also create a documentary/film that is 3 min or less that shows what it means to be a Nepali. Upload it on YouTube. Complete and submit the form below. Use your camera/smartphone to take a photo of people that you think represents Nepal. Upload it on Google Drive or Dropbox. Complete and submit the form below. Also if you have questions on what kind of submissions we are looking for, watch this video! And check out this video for tips on how to take good photos/videos with your smartphone!